I came into Unity on my knees. I learned that Faith is in the head. By focusing on God, because the spinal cord ran down from the brain to the base of the spine my whole body would be filled with light. This caused the Kundilini (Holy Spirit) to rise and connect me to God, literally. Of course Faith and Strength (Peter and Andrew)were brothers, they cannot be separated. I feel sad that Love is being the power of the month in February because of Valentine. Unity is making spiritual paraplegics by not teaching what Charles Filmore taught. Then the other two brothers are being split. Wisdom, in the solar plexis, where our past lives are stored, and love, in the heart are connected by ganglions of nerves. They too are brothers (James and John). When someone is having a heart attack they may only have indigestion, and vice versa. Why has Unity started teaching untruths? The silver cord is attached in three places-the head, the heart and the solar plexis and at each connection is a seed atom, something like a computer chip. 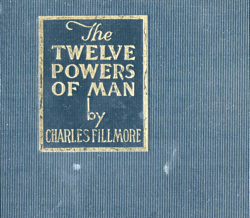 Mr. Filmore was obviously a very enlightened being and I thank God for the original truths which he taught.